On February 2, 1653, New Amsterdam was incorporated. What a great story. Huh? Does it lack the steamy drama we have come to demand? Even if we know, from the song Istanbul or elsewhere, that New Amsterdam was later renamed New York City which, if you like big cities, remains one of civilization’s jewels? Well, let me try to defend this admittedly un-bodice-ripper-like choice of theme. I have commented before on the stunning military, economic and cultural imbalance between Western Europe and the rest of the world by 1500 that led a speck of land like the Netherlands become a global empire. (No offense to the Dutch; I actually mean it as a compliment. But nobody looking at the Netherlands and India in 1450 would have thought the former would start picking off bits of the latter within two centuries including fighting Portugal for them.) But there’s more, or rather, there’s a side to the story that helps explain why the imbalance was so enormous. And it’s precisely the incorporation of municipalities with genuine legal rights and "liberties" in places like England and the Netherlands. 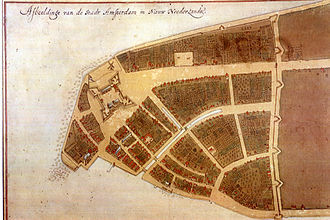 New Amsterdam itself was founded as a political entity, unsurprisingly, in 1625. It was the seat of the colonial government of New Netherland. But the "factorij" outside the fort, though protected by and closely associated with it, was a private venture. As were earlier Dutch ventures including in what would later be Albany and, not coincidentally, the various early English colonies from Massachusetts Bay to Jamestown. Indeed, New Netherland itself was originally a private venture of a sort Emperors and Tsars would not tolerate or keep their plundering hands off if they prospered. It was still a small settlement, under 300 people in the 1640s. Life was hard and survival uncertain. But people do things the way they think proper even in adversity, and hence in 1653 New Amsterdam became a city with, crucially, municipal rights. Not just duties. Not paper promises. Real genuine legal guarantees of their right to make decisions and live with the consequences without sudden arbitrary deprivation. (Not entirely coincidentally, the first Jews seem to have arrived in 1654.) Two years later, on September 15, 1655, a massive Indian attack destroyed farms and killed around 100 people while carrying off another 150. But the colony rebounded. After a bunch of rhubarb New Amsterdam of course wound up in the hands of the English and later the Americans. But in the big picture there is far more similarity than difference in how the Dutch and English treated their citizens and their political and economic rights, namely with respect. And it gave their nations, and their settlements, a dynamism not found elsewhere. Had New Amsterdam been New Moscow, New Teheran or New Beijing we would not be having this discussion. Which is a major reason it wasn’t.